Our nursery is available for children 0-1 years old during the Sunday School hours and 0-3 during the morning worship. 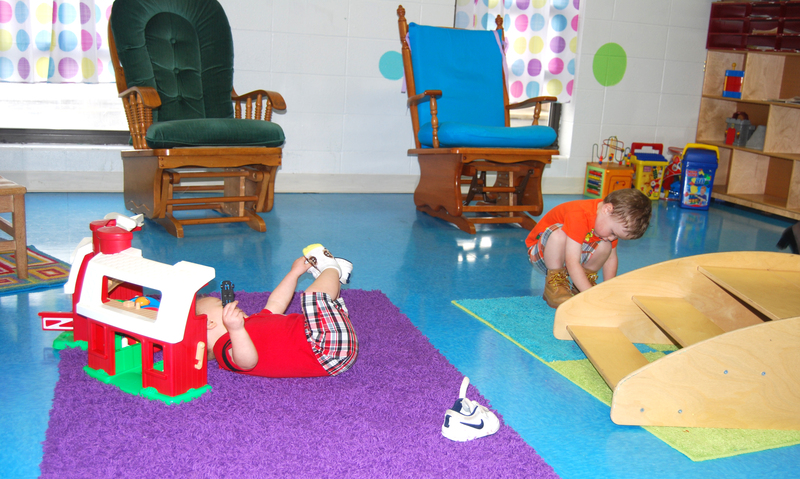 The nursery is under the direction of Andi Scheets and staffed by volunteers of the church. Nursing and quiet room for mothers. Crib and separate room for babies. No children are allowed in the nursery without an approved nursery worker or adult present at all times. The nursery will be locked during all non-church service hours. Anyone leaving a child in the nursery must take a pager. A parent or guardian must pick up children, and they must have the correct numbered pager for the child they are picking up. No child will be allowed to leave the nursery without an adult. No children will be allowed to stay in the nursery if they display signs of illness. For the safety of other children, please do no bring children to the nursery if they aren't feeling well or have been diagnosed with a communicable disease. Children will be served snacks and juice while in the nursery. Please inform the nursery worker or any food allergies before dropping off the child.